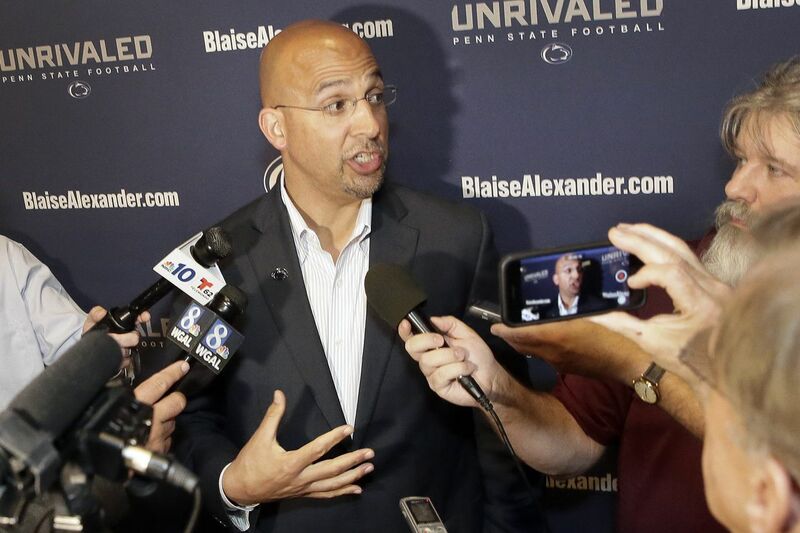 Coach James Franklin's Nittany Lions get a top-10 ranking. Penn State is ranked No. 9 in the nation in the 2018 Amway preseason coaches poll. The Nittany Lions, who finished 11-2 last season, are one of five Big Ten teams ranked in the top 14. They will play the other four this season – No. 3 Ohio State on Sept. 29, No. 7 Wisconsin on Nov. 10, No. 12 Michigan State on Oct. 13, and No. 14 Michigan on Nov. 3. All those games except for Michigan will be at Beaver Stadium. Top-ranked Alabama, the defending national champion, received 61 of the 65 first-place votes of a panel of college football coaches. No. 2 Clemson received three first-place votes, and Ohio State got one. Georgia is ranked No. 4, followed by Oklahoma and Washington. Miami is ranked eighth and Auburn, 10th. Notre Dame comes in at No. 11, and Stanford is ranked 13th. Southern California is No. 15, followed by Texas Christian, Virginia Tech, Mississippi State, Florida State and West Virginia. The final five teams in the Top 25 are Texas, Boise State, Central Florida, Louisiana State, and Oklahoma State.